The MORS Emerging Techniques Special Meeting (METSM) will feature high-quality technical presentations from leading experts from both inside and outside the MORS family and provide an opportunity for consumers of analysis and non-traditional providers of analysis to meet and share their needs and capabilities. METSM will provide a forum for presentations, demonstrations, and discussions on developing and employing emerging analytic techniques with an eye toward the problems of the National Security Community. Keynote Speaker: Dr. Les Servi of the MITRE Corporation and participant of two Defense Science Board studies. His diverse interests include the analysis of social media, cyber security, portfolio analysis for some government procurements, designing of software test plans, and evaluating Human Social Cultural Behavior (HSCB) government sponsored projects. He is an INFORMS Fellow and a former member of the Board of Directors of INFORMS. Dr. Karla Hoffman is a Professor in the Systems Engineering and Operations Research Department at George Mason University (GMU). Dr. Hoffman's primary research areas are optimization and auction theory. Her research focuses on the development of new algorithms for solving large complex problems arising in industry and government. She has more than 100 published papers in these areas and has served on the editorial boards of numerous Journals. Prior to joining GMU she worked at the National Institute of Standards and Technology as a mathematician. Susan M. Sanchez is a Professor in the Operations Research Department at the Naval Postgraduate School. Her research interests include the design and analysis of large-scale simulation experiments. She established and serves as Co-director of NPS’s Simulation Experiments & Efficient Designs (SEED) Center for Data Farming. Dr. Sanchez has long been active in the simulation community, and will be recognized as a Titan of Simulation at the 2016 Winter Simulation Conference. Dr. Jiawei Han is a leader in Data Science and Data Warehousing. He is a Fellow of ACM and Fellow of IEEE, and received 2004 ACM SIGKDD Innovations Award, 2005 IEEE Computer Society Technical Achievement Award, 2009 M. Wallace McDowell Award from IEEE Computer Society. His co-authored book "Data Mining: Concepts and Techniques" has been adopted as a textbook popularly worldwide. David L. Alderson is an Associate Professor in the Operations Research Department and serves as Director for the Center for Infrastructure Defense at the Naval Postgraduate School (NPS). He is also a member of the NPS Cyber Academic Group, which has academic oversight of interdisciplinary cyber curricula on campus. Dr. Alderson's research focuses on the function and operation of critical infrastructures, with particular emphasis on how to invest limited resources to ensure efficient and resilient performance in the face of accidents, failures, natural disasters, or deliberate attacks. His research explores tradeoffs between efficiency, complexity, and fragility in a wide variety of public and private cyber-physical systems. Dr. Alderson has been the Principal Investigator of sponsored research projects for the Navy, Army, Air Force, Marine Corps, and Coast Guard. Dr. Alderson received his doctorate from Stanford University and his undergraduate degree from Princeton University. He has held research positions at the California Institute of Technology (Caltech), the University of California Los Angeles, the Xerox Palo Alto Research Center (PARC), and the Santa Fe Institute. He has extensive industry experience and has worked for several venture-back startup companies. His early career was spent developing technology at Goldman Sachs & Co. in New York City. Harrison Schramm is a Principal Operations Research Analyst at CANA Advisors, and is the General Chair for the inaugural MORS Emerging Techniques Special Meeting (METSM). His distinguished career in Operations Research spans both academic and production roles. He is a Certified Analytics Professional (CAP) and is jointly accredited by the American Statistical Association and Royal Statistical Society. He is a 20-year veteran of the US Navy, serving in helicopter squadrons based in Norfolk, Virginia, Agana, Guam, and Bahrain. You can find his linkedin page here. Dr. Paul Nicholas is an Operations Research Analyst at the U.S. Marine Corps Operations Analysis Directorate, and is the co-chair for the inaugural MORS Emerging Techniques Special Meeting (METSM). Paul is also an adjunct faculty member at George Mason University, where he teaches a graduate course on analytics and decision analysis. His research interests include optimization and simulation, focusing on applications in cyberspace and electronic warfare. 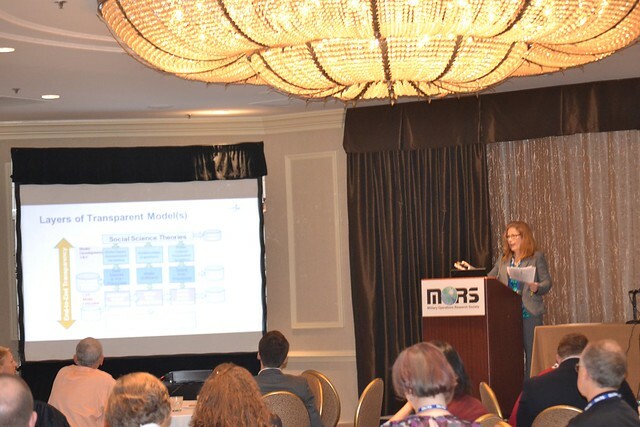 As leaders driving innovation within the operations research and national security analysis community, the Military Operations Research Society (MORS) invites you to the MORS Emerging Techniques Special Meeting (METSM) being held 6-7 December 2016 at the Hilton Mark Center in Alexandria, VA. METSM will feature high-quality technical presentations from leading experts from both inside and outside the MORS family, and provide an opportunity for consumers of analysis and non-traditional providers of analysis to meet and share their emerging needs and capabilities. This two-day event will provide a forum for presentations, demonstrations, and discussions on developing and employing emerging analytic techniques with an eye toward the problems of the National Security Community. This meeting takes the conversation about national security analysis beyond what is happening now and looks at the future of where technical analysis will be in 5-10 years and beyond. Frontiers of Networks – The field of Networks, and the use of these mathematical constructs has exploded in recent years. This track will feature cutting-edge work in several applications. MORS invites you to an Industry Partner-only special opportunity to exhibit at the inaugural MORS Emerging Techniques Special Meeting (METSM) this December. This two-day exhibiting opportunity will begin on Tuesday, 6 December at the Hilton Mark Center in Alexandria, VA and will continue through the evening social. Exhibiting will resume Wednesday to the conclusion of the meeting. Don’t miss the opportunity to exhibit where consumers of analysis and non-traditional providers of analysis meet and share their needs and capabilities! To reserve a space, simply contact Eric Kokuma ( eric.kokuma@mors.org). Please note that there is no additional cost to exhibit as a MORS Industry Partner. 6 December at 6:30pm. The Social and Job Fair will be a forum for those thinking about broadening their career in analysis to network and hear about current trends. This event will be open to METSM participants, MORS Industry and Institution Partners, all exhibitors and free to MORS Members, regardless of their participation in the METSM. For more information about participating as an exhibitor, please contact eric.kokuma@mors.org. Please direct all inquiries for press credentials at the Emerging Techniques Special Meeting (METSM) to Eric Kokuma, MORS Director of Member Services, eric.kokuma@mors.org or 703-933-9077.